An eventful geological past allowed for multitudes of magnificent and varied soils to appear. All the formations are present in Alsace from the Proterozoic eon to the Quaternary period. Around 50 million years ago, during the Tertiary period, the Rhineland mountain range collapsed, slowly at first and then violently, creating what is the present Rhine Plain. These successive collapses contributed to intensely revamping and segregating all the geological layers. 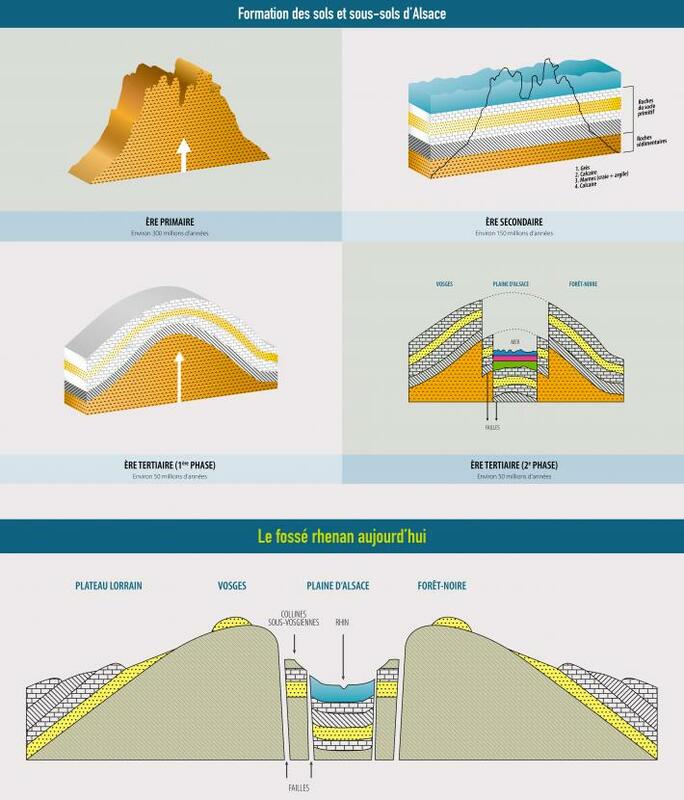 Sea and river deposits as well as erosion then occurred adding to the complexity. In the end, three morpho-structural units stood-out on the Alsace side of the rift valley: the Vosges mountains (granite and sandstone, sometimes shale), the sub-Vosges hills boasting incredible soil diversity and the Rhine alluvial plain (marl and alluvial). In addition, the four fracture fields should be pointed out (Saverne, Ribeauvillé, Rouffach-Guebwiller and Thann) which fragment even more the wine-growing region. Today, most of the wine-making villages are built on four or five different formations in a juxtaposition of oftentimes very restrained parcels, providing a mosaic of uniquely abundant and diverse soils. It’s within these infinite variations that resides the major part of the exceptional diversity of the Vins d’Alsace. Alsace geology is a like a mosaic, from granite to limestone along with clay, shale, and sandstone. Occupying a surface area of about 15500 hectares, this large patchwork of terroirs is absolutely ideal for numerous grape varieties to happily flourish. The terroir imprint bestows extra character and soul to Alsace wines, which are both unique and complex. Located on the Vosges mountain sides, they are composed of eruptive and magmatic rocks which break apart and crumble to form coarse sand called arenaceous granite, with weak water-storing capacity. The soil fertility depends on its degree of adaptation which helps release mineral elements. Wines produced on these chemically-acidic terroirs are always very expressive when young with a light structure. Shale is a flaky rock made from the compression of clay within the lithosphere. Fairly rare in Alsace (Andlau and Villé), these terroirs are rich in fertilising matter. With a fresh and elegant structure, the wines produced on these terroirs take a while to reveal their potential. 300 million years ago, volcanoes produced lava and ashes which became solid under water. The rock is hard, compact and doesn’t crumble easily. These dark, stony terroirs which retain the heat, sublimate the grape varieties. These intense and full-bodied wines have a smoky aroma. Sandstone is compacted or cemented quartz sand. Geologically fairly close to granite terroirs, with the same acidic and sandy character, sandstone terroirs have a very different expression. The wines produced there have longer backbone and are less aromatic. They also require more time for their complexity to be revealed. In Alsace it’s a sea-based limestone from the Mesozoic period. The most widespread are those from Muschelkalk and those from Dogger. These rocks crumble easily which result in very stony soils. On these chemically alkaline soils, the wines are always marked by a great acidic, broad and massive structure Very closed-up when young, these wines evolve towards a lemony character over time. They are composed of thick clay deposits (marl) and calcareous pebbles which form a rock called conglomerate with a slow and barely-visible evolution. The marl influence is sustained by a deliciously long and complex acidity. The wines are generous and long in their youth, becoming clarified as they admirably age. The more limestone is present, the finer the wines become. This is the sandstone variant of the marl-calcareous terroir. It’s still scree from the Tertiary period where this time the pebbles are sandstone. Marl provides weight to the wine whereas sandstone lightens it up. More generous than on a solely-sandstone terroir, the wine aromas are more complex than on a marl terroir. The sub-Vosges hills frequently have clay, limestone and sandstone soils. It’s the rock variety which creates the mineral wealth. These deep lands are therefore very fertile and boast great water-storing capacity. The limestone and sandstone lighten up the soil where the marl brings its weight. The wines take their time to harmonise these slightly incompatible components. These terroirs are fairly rare in Alsace. It’s sandy-limestone or calcareous sandstone, the quartz having generally been cemented by the limestone. These rocks basically don’t change. The highly-pebbly soils have a weak mineral fertility. The wines are explosive with rather intense floral expressions. Clay is the essential component of these light-bodied but compact rocks, producing heavy and fatty soils. There is a high chemical fertility due to the selected weight of various mineral components administered by the clay. Wines from this terroir have a weighty structure and take time to reveal their true nature. The strong presence of clay explains a taste of tannins even if these are white wines! Created during the Quaternary period, colluvium is deposit and scree at the foot of slopes, and alluvial fans from the Vosges valleys. The materials accumulated can be very different as the mineral-composition is dependent of the back-country rocks. The wines produced on these terroirs can therefore be very different. Located on the plain, they are composed of alluvium from rivers (pebbles, gravel, sand and silt) which accumulate on the terraces, often resembling materials from the valley alluvial fans. Nevertheless they can be distinguished from the washed and sorted look of the sand-grains and pebbles. The materials which form them depend on the waterway’s path and their source. Loess is a deposit from the Quaternary ice age period brought by the winds. It’s pale yellow silt which spoils when washed in the more clayey-brown loam. The thicknesses can vary, from mere plating on other terroirs up to masses of several metres. The wines produced on these 3 soil types boast a delicious minerality. They are marked by freshness and should be consumed when young.